Kayaking is one of the most versatile activities in the world of sports. Its intensity ranges from relaxing, meditative excursions to adrenaline-pumping trips through frothing rapids. People of all ages can enjoy it, including beginners and advanced kayakers alike. Kayaking can also accommodate solo riders or large groups, and trips can last anywhere from minutes to days. Most importantly, kayaking creates an immediate relationship between nature and riders. There is a sensation of give-and-take between the two as the rider attempts to read the language of the river. The river, in turn, ferries the rider through magnificent gorges and raucous rapids to create a feeling of having truly experienced the landscape. It is no surprise that the sport of kayaking engages everyone from youth groups to Olympic athletes — there is something for everyone in it. Let’s take a look at where kayaking came from and how you can try it out on one of America’s most scenic rivers. Long before the Roman Empire constructed the Colosseum, before ancient Greeks invented the modern city-state, kayaks were slicing through the icy waters of the far north. Manning them were the Inuit and Aleut peoples of the North American Arctic. They paddled expertly between chunks of sea ice, their eyes darting over waves and misty shorelines in search of food. From their vantage point above the surface of the water, they had both a visual advantage and the ability to chase down prey swiftly. Kayaks provided these people with an efficient means of transport and a stealthy, agile vessel for hunting fish, seals and whales. Early kayaks were made from driftwood, while others were made by stretching animal skins over whalebone frames. Waterproofing was done with whale fat, and seal bladders full of air would provide extra flotation for the heavily loaded craft. Umiaqs were larger versions of kayaks, used for transporting families and belongings, but it was the kayak that reigned supreme in hunting. After Europeans adopted the kayak in the mid-19th century, they soon saw it in a different light: they discovered how fun it was to pilot down rivers. It still had a utilitarian use, as evidenced by its addition to Arctic and Antarctic expeditions, but it wasn’t long before the kayak became more than just a means of getting work done. In 1931, a European named Adolf Anderle made the first-known whitewater kayak trip, careening through the infamous Salzachofen Gorge. This feat inspired many others to begin trying their hand at the burgeoning sport. Soon after, an international standard for rating rapids was set up, and kayaking entered the Olympics a mere five years after Anderle had pioneered the sport. The rest of the world fell for kayaking soon after. In 1938, a French woman named Genevieve De Colmont kayaked the whitewater sections of the Colorado River and Green River. Fiberglass kayaks came into being around the middle of the century, which were replaced by plastic models 30 years later. Around this time, kayaking began to enjoy a much more widespread level of recognition. Since then, whitewater kayaking has become a much-anticipated part of the Olympics. All over the country and world, enthusiasts and first-time kayakers flock to scenic rivers for a fun time. The city of Reno, Nevada, has even breathed new life into its economy by opening a designated kayak park in its downtown area. Many other places have followed suit. As a result, they have seen millions of dollars flow into their pockets and created a special place for spectators and athletes to congregate. The Chattooga River has its sources in the highlands of North Carolina’s Appalachian Mountains, where spring water and fresh mountain rainfall sends small creeks flowing down into its watershed. By the time it reaches its terminal point at Lake Tugaloo, the water has dropped several thousand feet in altitude and has traveled through some of the most beautiful landscapes in the country. The Chattooga is a designated Wild and Scenic River — it’s one of the few rivers in this part of the country that has not been dammed. As a result, the sensation of natural wilderness is outstanding. Cars, trucks and any other sort of motorized vehicle are not allowed to travel within a quarter-mile of the river. Additionally, there are very few structures along its banks, and most of it is traversed only by hiking paths. Because the river cuts through bedrock, it is home to some spectacular rock formations. It contains tight, fast-flowing channels and deep, crystal-clear pools, as well as towering cliffs topped by lush greenery. This natural beauty, along with the river’s many world-class rapids, makes the Chattooga a real paradise for whitewater kayaking. The river has multiple sections, each suited for different skill levels. This gives beginner, intermediate and advanced kayakers equal opportunities to have fun and improve their skills. Section II: Section II is an excellent place for beginners to learn how to maneuver, roll and exit their kayaks. It consists of calm waters and up to Class II rapids. Here, there are plenty of opportunities to practice reading the water, as well as how to identify eddy currents and other features in the river. Section III: Section III is a step up for kayakers looking for a bit more adventure. Passing through gorges and offering Class III rapids, this section provides fun, fast-paced channels and lots of opportunities to master skills. There is even Bull Sluice, a class IV rapid that features a double drop for the daring. Section IV: Section IV is the ultimate section of the Chattooga River that offers the most challenging rapids on this side of the Mississippi. Anyone looking for an incredible kayak adventure should look no further than our Advanced Clinic — there is just nothing that tops it. Expect Class IV rapids and lots of incredible, skill-building challenges. 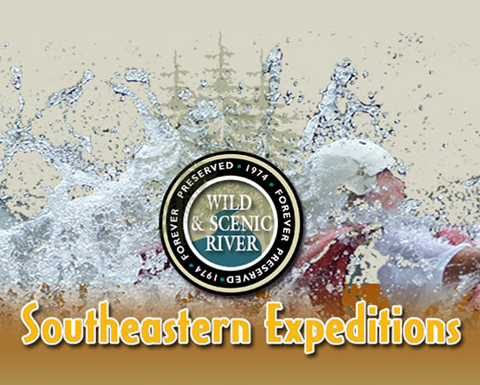 At Southeastern Expeditions, we make one of America’s most alluring rivers accessible to all. We want to show everyone how much fun it is to splash into the river in a kayak, glide smoothly through its canyons and even conquer its whitewater sections. Here are the three different ways we get you out and into the water. InstructionKayaking is a lifelong learning pursuit, but luckily, it doesn’t take much to start having fun. We offer all levels of canoe-kayak instruction, whether you are just starting out or looking to add to an advanced set of skills. Wet Exit: The first question beginners often ask is how to escape if need be. The answer is the wet exit, a tried and true technique for loosening your spray skirt and quickly slipping out of the kayak. Kayak Posture: Learning how to maximize power and efficiency with posture is an important skill for endurance and comfort. You’ll learn the basics, including keeping a straight spine and paddling with your arms, not your torso. How to Brace: Bracing is the best way to stop yourself from flipping when something knocks you off balance. It involves smacking the water with your paddle and throwing your upper weight momentarily toward the water, which gives you enough resistance to push yourself upright. Turning: There are two main ways to turn your kayak. They are the reverse stroke, in which you paddle backward on one side to rotate, or the forward sweep stroke, in which you paddle forward in an arc-like sweep to turn. Eskimo Roll: One of the most famous of all kayak moves is the Eskimo Roll. This is a method of uprighting yourself after rolling over in the water, using your paddle and body position. We also offer instruction courses for intermediate riders to increase their skills on the Class III rapids of the river’s Section III. We’ll teach you how to read the particular nuances of Georgia’s whitewater and ride specific lines. Our advanced clinic takes kayakers on Georgia’s most challenging whitewater routes. This clinic focuses on improving expert-level skills to navigate tough rapids and take the ride of a lifetime. All of our kayak instruction clinics on the Georgia whitewater include lunch. These courses offer superb value and the chance to both have fun and improve your skills in the most beautiful setting we know. Individual vs. Group InstructionAs avid kayakers ourselves, we understand many of our guests want a one-on-one session with a skilled instructor. We accommodate this wish by offering individual instruction kayak courses. Our instructors will focus on your particular needs and preferences, allowing you to advance quickly. We also offer group kayaking courses that are a blast for any group — such as college students, boy and girl scouts, corporate groups, youth groups and more. These courses will take the group on a fast-paced, education-packed adventure that will be equal parts fun and bonding experience. Overnight Kayaking Trips in GeorgiaThere is nothing quite like setting out on our overnight kayak trips. They are the truly immersive experience for anyone who wants to dive headfirst into nature. We’ll provide all the equipment and instructions, then let you and the river do the talking. We start with a fun day of paddling Section III, which has its own challenges and rapids. After this, we pitch camp in the Sumter National Forest and let the sounds of nature and babbling water send us off to sleep. In the morning, we ramp up the adventure with Section IV, the most daring set of rapids for a thousand miles. With names like Corkscrew, Jaw Bone and Sock ‘Em Dog, these rapids are legendary and will keep you smiling. Without a doubt, our overnight kayaking trips offer the best value anywhere in Georgia or the Southeast. We offer smaller class sizes and lower prices, all while maintaining the level of quality and safety that has set us apart with our guests. This value is apparent from the get-go — as you float down the river, it becomes evident that this is no ordinary kayak trip. This is a full-on immersion experience, allowing you to get to know the river in a way that is just unattainable by other means. You’ll float, plunge and paddle through some of the oldest lands on earth, and when you stop for the night, your belly will be happy to see the delicious food your guide cooks up. In the morning, a southern-style breakfast will wake you up. Then, it’s time to tackle the meanest rapids on the whole river. What’s truly incredible is that nearly anyone can do them. Kids over the age of 12 will be able to handle the rapids, and you’ll always our skilled guides will always be supervising the group. All you need to bring is a sleeping bag, a willingness to paddle and a spirit of adventure. We’ll provide the rest. Who Is This Type of Adventure For? Everyone is welcome on a kayaking adventure, provided they can paddle and are at least 12 years old — though younger children may be permitted in more novice clinics. That means families can come and let our guides give them the best vacation they could imagine. Boy and Girl Scout Troops: We are old pros at guiding the perfect Boy Scout or Girl Scout expedition. Scouts learn new skills, group bonding, encouragement and teamwork as they make their way down Georgia’s most beautiful waters. Corporate Groups: Activities like kayaking are excellent ways to improve team dynamics and add a more robust sense of togetherness to corporate groups. When teams work together on a daily basis, it helps to have a jolt of adventure to reinvigorate productivity and communication. Feel free to discuss ideas with us — we’re always willing to get creative. Adventure Tours: The feeling of setting off on an expedition together is, for many of us, a once-in-a-lifetime experience. Families, friends, organizations and others looking to take a break from regular life can let Southeastern Expeditions guide them on an adventure tour. Groups of 15 or more people qualify for group discounts, which can save lots of money per member. Talk to us about our options for large groups, which we have designed to be fun and fast-paced while accommodating more guests. We also offer trips during the week with reservations. Kayaking is about getting outside, breathing fresh air and splashing around in clean mountain water. 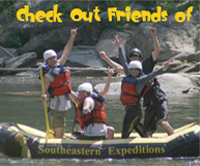 Southeastern Expeditions offers this experience to everyone with the best rates, guides and trip options anywhere in the southeast. Start planning your own adventure now by checking out our canoe and kayak trip options. Then, prepare to feel the electrifying zing of pure water as you ride it downstream. Get ready to laugh, shout and hoot triumphantly as you conquer new challenges and fall in love with Georgia’s most rugged landscape. And above all, get excited — you’re about to make a lifelong memory.